The Japan Aerospace Exploration Agency's Kounotori7 cargo ship undergoes preflight work ahead of a scheduled September 2018 launch from Tanegashima Space Center in southern Japan. After some delays, the spacecraft will launch on an H-IIB rocket at 2:15 p.m. EDT on Sept. 21, 2018 (3:15 a.m. JST on Sept. 22). 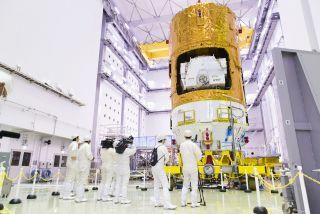 Update for Sept. 20: Japan's space agency has delayed the launch of the Kounotori7 cargo ship to no earlier than Saturday, Sept. 21, at 1:52 p.m. EDT (1752 GMT/2:52 a.m. JST on Sept. 23) due to bad weather expected at the Tanegashima Space Center launch site. Our original preview story can be seen below. The Japan Aerospace Exploration Agency has set a new launch date for its next uncrewed cargo ship bound for the International Space Station after more than a week of delays due to bad weather and technical issues. The new Kounotori7 cargo ship will now launch Friday, Sept. 21, at 2:15 p.m. EDT (1815 GMT) from JAXA's launch site at the Tanegashima Space Center in southern Japan, where the local time at liftoff will be 3:15 a.m. on Sept. 22. Additional launch opportunities are available from Sept. 23 to Oct. 31, in case there are more delays, JAXA officials said. "Necessity arose to investigate the H-IIB F7 propulsion system, forcing MHI and JAXA to cancel the launch previously rescheduled for September 15, 2018," JAXA officials wrote in an update today (Sept. 19). "MHI and JAXA have taken the course of action necessary to identify and deal with the cause that the investigation revealed." JAXA's Kounotori resupply ships (their name means "White Stork" in Japanese) are disposable spacecraft designed to launch cargo and scientific gear to the International Space Station. The vehicles launch on an H-IIB rocket and rendezvous with the station, where they are captured by astronauts using a robotic arm and attached to an available docking port for unloading. The Kounotori spacecraft can deliver supplies inside a pressurized compartment for astronauts to access, as well as in an unpressurized compartment accessible by robotic arm to deliver new science gear or components for the station's exterior. At the end of their missions, the vehicles are loaded up with trash or unneeded items and released back into space so they can be intentionally burned up in Earth's atmosphere. Kounotori7 (also known as HTV-7) will deliver six new lithium-ion batteries for the space station's power system as part of its resupply mission. The spacecraft is also carrying a series of tiny satellites known as cubesats for various studies, including a highly anticipated space elevator technology test and a novel re-entry space capsule to test a new technique for returning experiment samples to Earth.